Bradford & Bingley did not demutualise, which is what the British call going public, until December 2000. Just eight short years later, with the credit crisis casting a pall over the European economy, the company was nationalized on Monday, September 29, 2008. 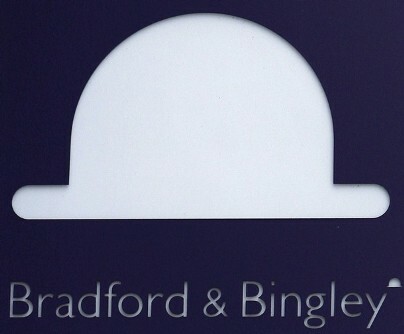 Mortgage lender Bradford & Bingley confirmed Monday it is to become the second bank nationalized by the British government since the financial crisis began. British Finance Minister Alistair Darling said B&B assets were sold to Santander’s Abbey division for just over £600 million pounds, or about $1.1 billion. So, over the course of one weekend, more than 150 years of toil and profit were rolled up into a tidy little package, but to find the beginning of the end we must go back to the beginning of the new century and credit bubble. It was then that chief executive Christopher Rodrigues rid the company of pomposity and the bank paid more than £1,000 for Stan Laurel’s bowler, which went on display at the head office. The purchase was a witty, if expensive, nod to its corporate logo: two City gents sporting pinstripes and bowlers. The fictional Mr Bradford and Mr Bingley, appeared on television adverts for the bank from the 1970s, exuding an air of conservative financial solidity – underlying B&B’s position as Britain’s second biggest building society, founded in 1851 to build a better future for the people of northern mill towns. But it was the new CEO Steven Crawshaw, who put the the company on the road to ruin by personally overseeing the demutualization even though it was resisted. At the time the move was strongly resisted by many on the lender’s board of directors, including Rodrigues himself, but it was pushed for by many of its members. He argued it could continue to expand while remaining free from the stock exchange. But the promise of a windfall of at least £1,000 was too much for many of its members. Customers received a minimum of 250 free shares at the flotation price of 247p when the shares started trading in 2000. It was Mr Rodrigues’ successor Steven Crawshaw that was responsible for changing the nature of those customers. Apparently, if Crawshaw couldn’t change the nature of those customers, then £1,000 and 250 free shares at 247p piece certainly could. Thus the demutualization transformed the building society into a British Countrywide Financial where reckless leveraging and disregard for future consequences could dominate. Traditionally, building societies relied on their savers to fund their mortgage business. For each £1 deposited, they would lend out £1 and make a profit on charging more to their borrowers than they offered to their savers. But B&B, like many aggressive de-mutalised building societies turned to the international money markets to allow it to lend ever greater sums of money. It now has £22 billion of savers’ deposits but nearly double that in mortgages – £41 billion. B&B was so keen to increase the number of mortgages it owned, that it hoovered up “specialist” loans from rivals, buying up its Kensington mortgage company as recently as last year, when some commentators were already starting to warn the UK housing market was unsustainable. But the bubble burst faster than it expanded and Bradford & Bingley launched a £400M rights issue which was not well subscribed. This left much of the issue with underwriters, and when TPG Capital, who had previously agreed to take a 23 percent stake in the company, withdrew their support, B&B was finally doomed. The Cutting of 350 jobs was not nearly enough to save the company, and so with options and time running out, the British government moved in and nationalized the bank. “The bowler hat is used for general products, mortgages and investments, so it covers both sides of the business,” says Ms Ramage, of Alexander Ramage Associates. FURIOUS critics hit out last night as the Government gambled the equivalent of £1322 for every UK taxpayer on nationalising the Bradford & Bingley. A statement will be issued to the Stock Exchange today on Gordon Brown’s rescue plans amid fears for the UK financial system. But there was growing anger from taxpayers’ groups and shareholders that the Government will take responsibility for “toxic debts” among the bank’s £40billion mortgage book. If property prices continue to fall and repossessions rise, taxpayers will have to pick up the bill. It’s safe to assume that property prices will continue to fall and repossessions will rise. It’s a safe bet that taxpayers will have to pick up the bill.